I recently attended Mixed on a scholarship* provided by Lucky Leaf. Mixed was an intimate conference, only about 100 bloggers, and it was different and a lot of fun. There were some hands-on cookie and cake decorating demos, sessions on food styling that did not pull ANY punches, parties every night, and movies and snacks at midnight. As I said, different and lots of fun! I was lucky enough to receive a scholarship to attend courtesy of Lucky Leaf, makers of pie fillings and preserved fruits. To get this scholarship I had to agree to create a recipe using one of their Premium Pie Fillings. These fillings contain no high fructose corn syrup and the first ingredient is real fruit. I did not hesitate to say yes, and – as promised – here is my recipe! 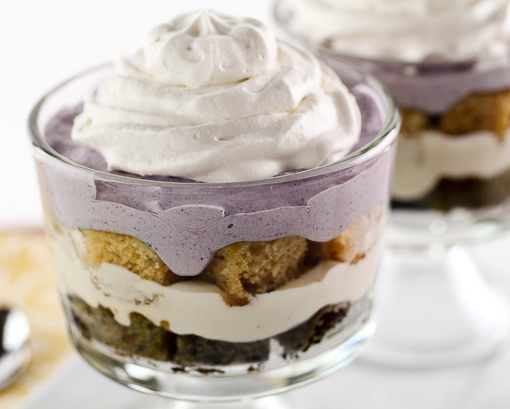 I love trifle desserts. They are pretty, make ahead friendly, and they always impress. For this dessert I wanted a taste of summer so I decided on the Premium Peach and Premium Blueberry fillings. I decided, to double my fruity flavor goodness, to make fruit infused cake AND a quick fruit mousse. 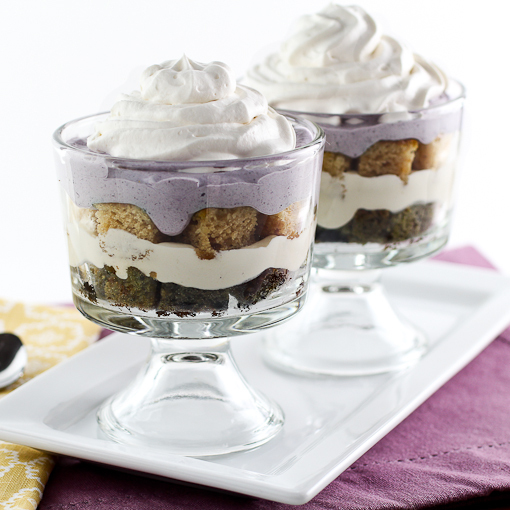 This recipe serves 8, but it could easily serve 16 if you built the trifles in tall shot glasses for a cocktail party, or as part of a dessert sampler. You could substitute any flavor of Premium Pie Filling you like – Dark Sweet Cherry and Red Raspberry would be a lovely alternative! 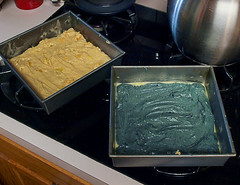 Heat the oven to 350 F and spray two 8x8-inch square cake pans with non-stick cooking spray. 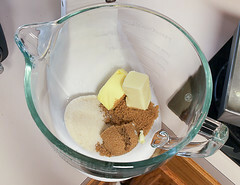 In the work bowl of a stand mixer fitted with the paddle attachment, or in a medium bowl with a hand mixer, combine the brown sugar, sugar, and butter. 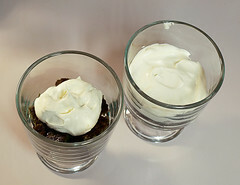 Cream together until just combined but not fluffy, about 30 seconds. Add the egg and beat on medium speed until lighter in color, about 1 minute. 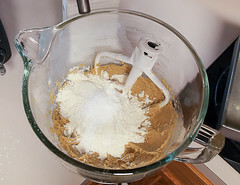 Add the flour, baking soda, salt, and baking powder and mix on low speed to just combine then add the buttermilk and mix on medium-low speed until the batter has no large lumps. 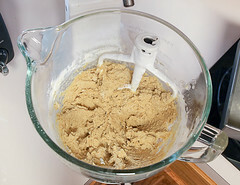 Remove ½ of the batter and set aside. 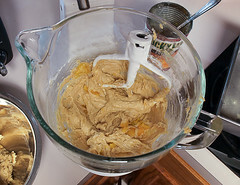 To the remaining batter add the peach filling. Mix on low speed until combined, about 30 seconds. 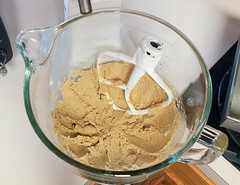 Spread the batter into one of the prepared pans. 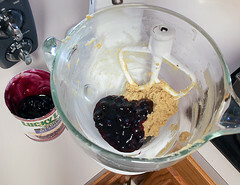 Now, add the reserved batter back to the bowl with the blueberry filling. Mix on low speed until well combined, about 45 seconds. Spread the batter into the remaining pan. Bake for 16 to 20 minutes, or until the cakes pull away from he sides of the pans and the center of the cake springs back when gently pressed. Cool for 10 minutes in the pan then turn out onto a wire rack to cool to room temperature. While the cakes cool prepare the mousse fillings. 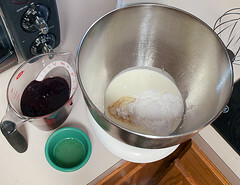 In three small bowls divide the gelatin and water. Mix to combine and let stand at room temperature for 10 minutes to bloom. Heat one of the bowls of gelatin in the microwave for 8 seconds to melt. Set aside to cool slightly. 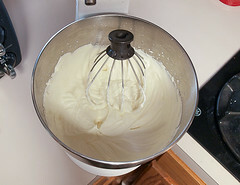 In the work bowl of a stand mixer fitted with the whip attachment, or a large bowl with a hand mixer, combine ⅓ of the cream, 2 tablespoons of powdered sugar, and 1 teaspoon of vanilla. 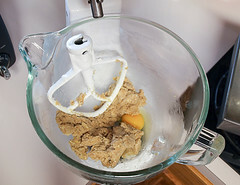 Mix on medium speed until the mixture starts to thicken, about 40 seconds, then pour in the melted gelatin and increase the speed to high until the cream forms soft peaks, about 35 to 45 seconds. 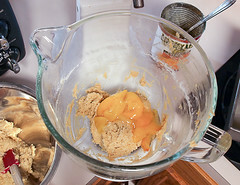 Add the peach puree and continue to whip until the mixture forms firm peaks, about 30 to 45 more seconds. Transfer the mixture to a clean bowl, cover with plastic and chill for 1 hour. 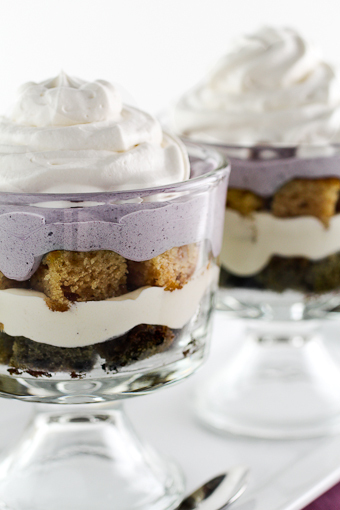 Repeat this process with the blueberry filling. 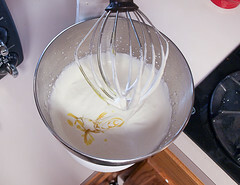 With the remaining cream, prepare it as above, omitting the fruit, whipping to medium firm peaks. To assemble cut each cake into ½-inch cubes. 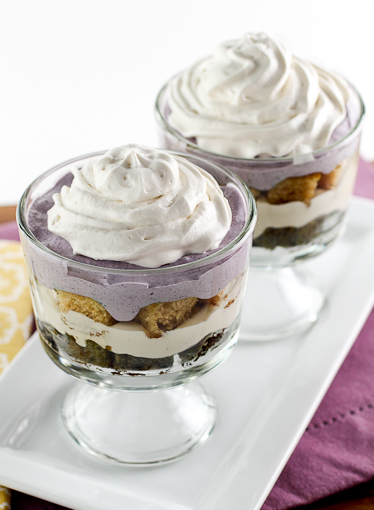 In one large trifle dish, or in 8 individual dishes, place an even layer of blueberry cake, then spread over all the peach mousse, then the peach cake cubes, then all of the blueberry mousse. Finally top the trifle with the plain whipped cream. Chill for at least one hour before serving. *Evil Shenanigans Product Review Policy and Payment Disclosure– Lucky Leaf provided me a sponsorship to Mixed, samples of their pie filling, and gift items at no cost in exchange for this blog post. Any opinion expressed is my own and is not influenced in any way by the manufacturer/PR firm. I only review products that I have personally tested and endorse.